You know you’re onto something good when you’re the only foreigner in a restaurant, and, when it comes to ramen, the only woman. This was my experience walking into Musashi in Roppongi, and it was one of the best decisions of my trip. Mostly a tsukemen restaurant, I chose the ramen option and have zero regrets. This is one of the best ramen I have ever eaten. The noodles were thick and actually had pepper inside them, which I’d never seen before. You can choose your quantity of noodles (size doesn’t change the price) and it comes with bamboo shoots, spring onion and two pieces of char sui pork. Watching the pork being cooked on a special grill plate, I knew this would be unlike any other ramen pork. Full of flavour, incredibly thick and tasty, this was without a doubt the best I’ve ever had. Oh and the broth – the broth was unctuous, thick and buttery with such a beautiful flavour I didn’t really think about how to describe it or break it down, it was just there to be enjoyed. 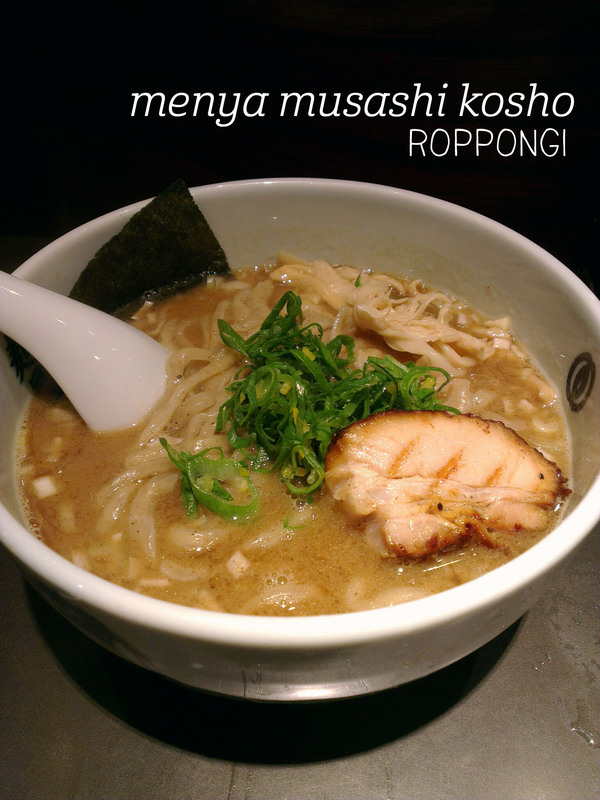 Definitely a must-visit for ramen fans. There’s dedication to food, then there’s this. Ever wondered what Michelin-starred ramen tastes like? So does pretty much every other person in Tokyo. We arrived at Tsuta around 11am and put a ¥1000 deposit down per person, and were told to come back for a 2pm sitting. We did, and finally got a seat at the counter at around 3:40pm. The atmosphere here is serious – no-body speaks, you just focus on enjoying your food and appreciating the passion and skill that has gone into making it. I ordered the Ajitama Shoyu Ramen (¥1200), with a soy sauce-based broth, seasoned egg, pork slices, bamboo and Japanese leek, plus a puree of mushrooms in truffle oil. You can smell the truffle oil as you walk in, and whilst the flavour doesn’t stand out in the broth, it serves to enhance the other flavours, including the beautiful mushrooms and roast pork slices. The noodles themselves were thin and had great bite to them, and the broth was beautifully balanced. Yes, it was a lovely bowl of ramen. No, it was not worth the incredibly long wait time. 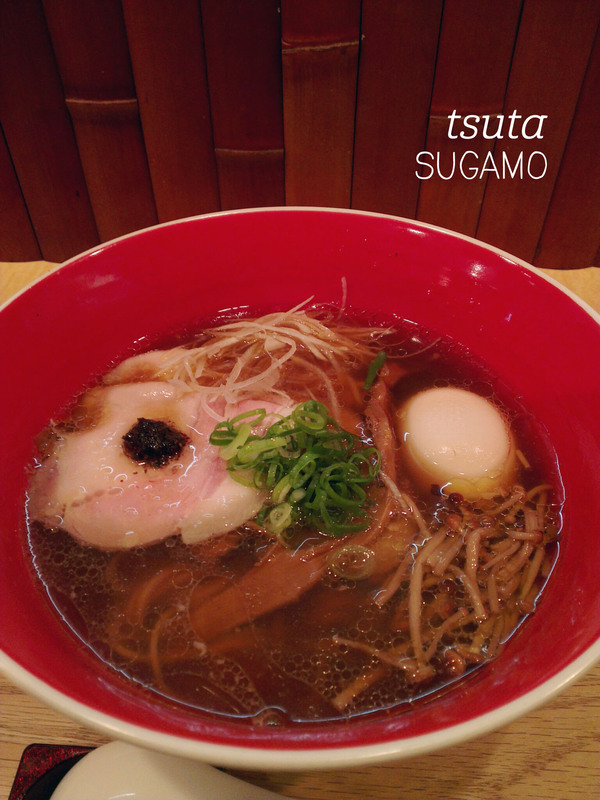 Be warned – there’s no tonkotsu (pork bone broth) option, so all the ramen here are of the lighter variety. A unique experience, but one I’m unlikely to repeat. As you may have guessed, I’m a big fan of Japanese food, so love visting The Galeries in Sydney, which is full of great Japanese dining options. Yayoi had been on my wishlist for a while, and when I finally made it, it didn’t disappoint. 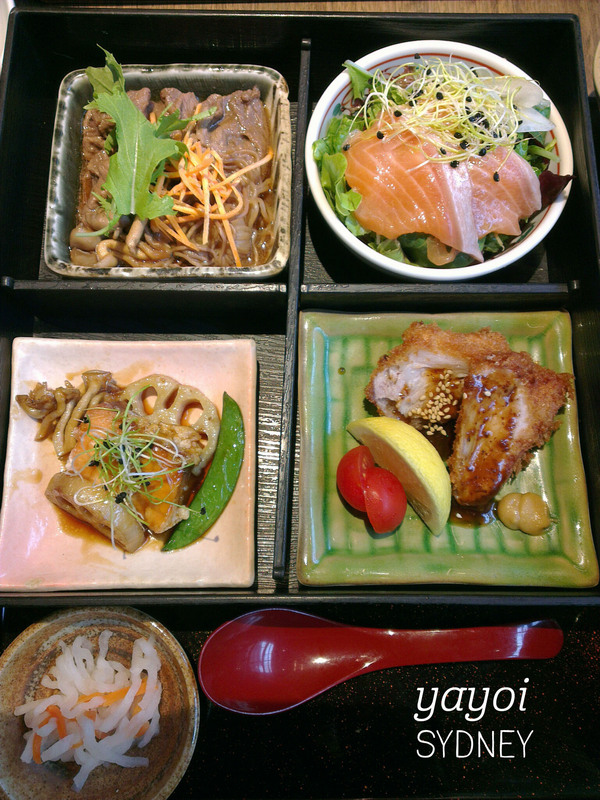 I ordered the Yayoi Gyozen ($30), the recommended meal set. It came with four beautifully presented dishes, so was a perfect sampler of their menu. The salmon teriyaki was a treat to begin – tender fish, sweet teriyaki and a nice mix of textured veggies to accompany it. Tick. The wagyu beef sukiyaki was similarly tasty, with thinly cut slices of beef and noodles with plenty of sauce, this portion was surprisingly filling. Tick. Next was the pork tonkatsu. with a super flaky, crispy batter on the outside and tender pork inside, not to mention the lovely tonkatsu sauce and a sprinkling of sesame. A light drizzle of lemon lifted this dish into supreme awesomeness. Tick. Finally, I savoured the salmon salad at the end, enjoying the refreshingly simple taste of the sashimi salmon and accompanying lettuce and sprouts. Tick. Everything was delicious, tasty and just the right size. Perfection. One of my friends came to visit from Melbourne recently, and we met at Penny University for brunch. I was immediately drawn to the salmon-laden options, and decided to try the ‘Winter Fishing in Yemen’ ($21) and a fresh watermelon, apple and mint juice ($7.5). 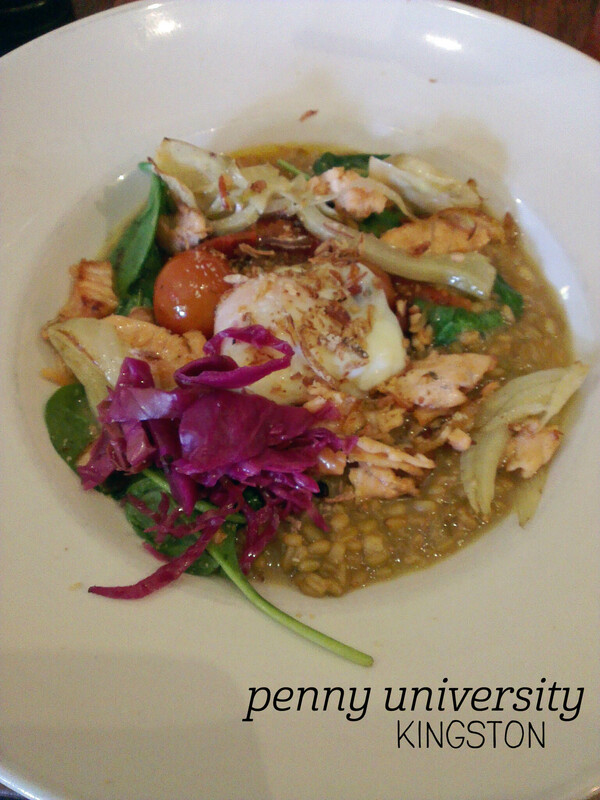 The dish comprised a freekeh risotto with miso salmon, roast fennel, cherry tomatoes and a 65 degree egg. The serving was huge, and I was impressed by the amount of salmon included – flakey, tender salmon, although to be honest, I couldn’t really taste the miso. The risotto had a fabulous texture, viscous and rich, although I found the whole dish rather salty (perhaps that was the miso’s contribution? ), just a shade past the point of enjoyably salty. Fennel isn’t generally my favourite, but it worked really well in this dish, adding some good textural contrast, although the cherry tomatoes kind of stole the show with their charred, sweet pops of flavour. Spinach leaves and red cabbage completed the ensemble, enriched by the perfectly runny egg. The serve was a bit too big for me, and I was glad of the juice to help quench my thirst – enjoyable, but probably not a dish I’d go back for in particular. I know I’m behind the crowd on this one – Soi has been dishing up noodles and other delicious things in the city for a while now – I finally stopped in for a weeknight dinner with friends. You order at the counter and I picked the chicken yakiudon ($15) and a cup of genmaicha ($4), my favourite Japanese tea. I’m usually wary of restaurants trying to do too much – the menu has Thai, Japanese, etc. 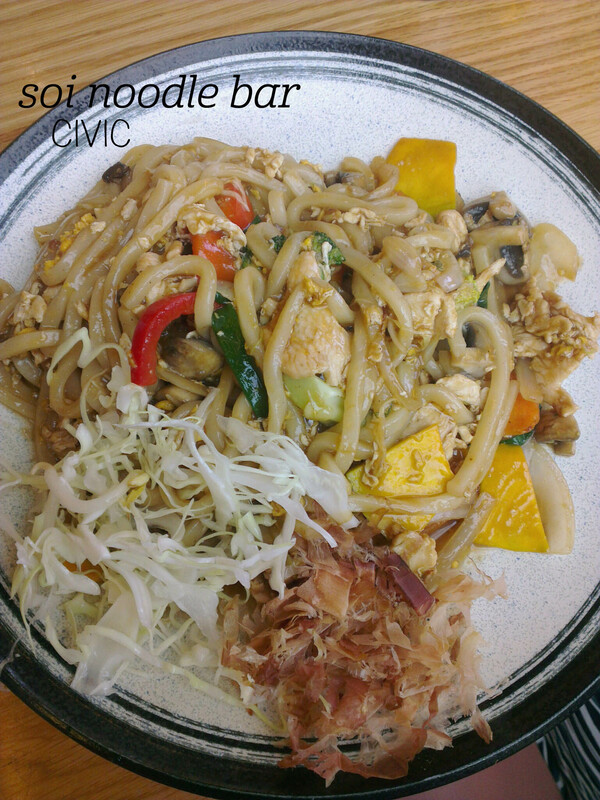 – but the yakiudon was pretty good considering it isn’t a specialty Japanese restaurant. Whilst the vegetables weren’t totally authentic (pumpkin? ), the flavour and texture mix worked well – the mushrooms were particularly good. There were plenty of bonito flakes and I really liked the yakiudon sauce – it clung well to the noodles, although was quite salty and left me thirsty. Luckily I ordered the tea – it came in a large mug and was a great example of genmaicha. The restaurant is nicely organised with plenty of seats and a fun mural on the back wall brightening the space. The staff were friendly and efficient, and for the price point, the food was good value and tasty. Gumshara is a happy place for me. Not because of the ambiance, or the décor, or the service; Gumshara is pure bliss for the taste buds. 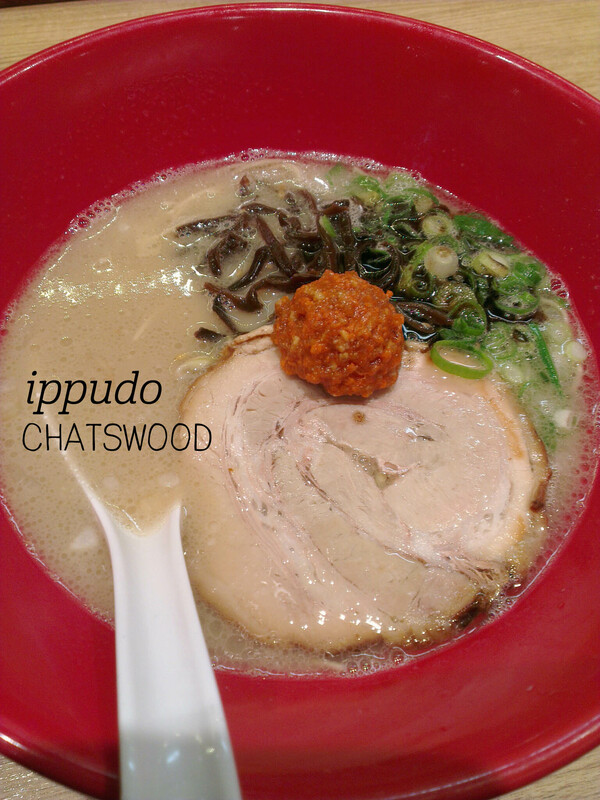 I know I’ve said it before, but this really is the best ramen in Australia. I ordered the tonkotsu ramen with a ramen egg, which is ready in a flash and served in a humungous bowl. There are two things that make Gumshara the best. One: the noodles. The ramen here have such great bite – it’s really very satisfying eating them, almost like the most perfect al dente pasta. Two: the broth. Ok, so this isn’t going to do your cholesterol any good, but who can resist a rich, thick, fatty, salty pork-bone broth in winter? Not me. The broth has a way of coating your mouth, like a layer of porky velvet. Mmm. The pork slices are tender and fatty, and I always like to add a sprinkling of sesame seeds for extra flavour. As always, the ramen eggs are the best, with the gooey, runny yolks and marinated whites that I can’t get enough of. 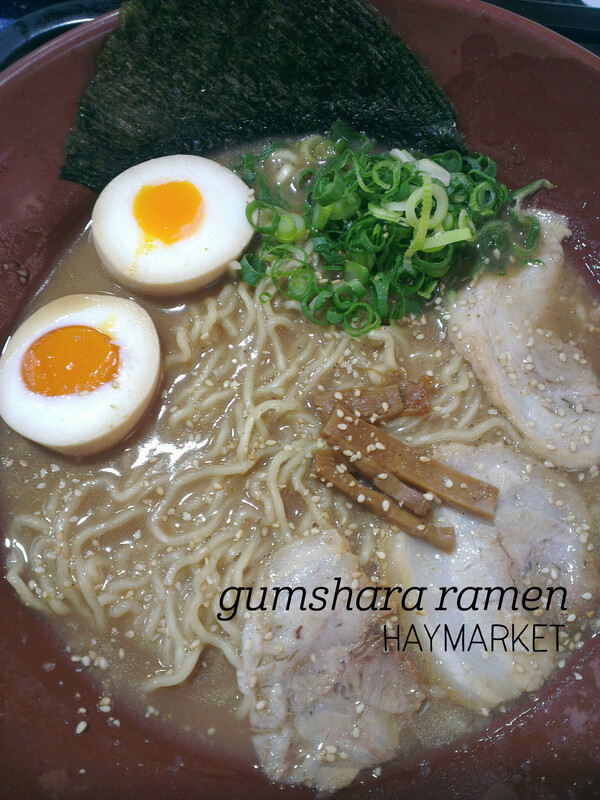 Gumshara Ramen, Shop 211, 25-29 Dixon Street, Haymarket NSW, no website.